Scotchman mdl. 12012 120 Ton Ironworker s/n 50589M1297 w/ 120 Ton Punch 1 ½” Thru 1”, Shear 1” x12”, ¾” x 16”, 5/8” x 18”, ½” x 24”, Angle Shear 6” x 6” x ½”, Rod Shear 1 ¼” Round, 1” Square, 90 Deg Notcher 6” x 6” x 5/16”, Brake 83 Ton @ 12”, 73 Ton @ 18”, 65 Ton @ 24”. Scotchman mdl. 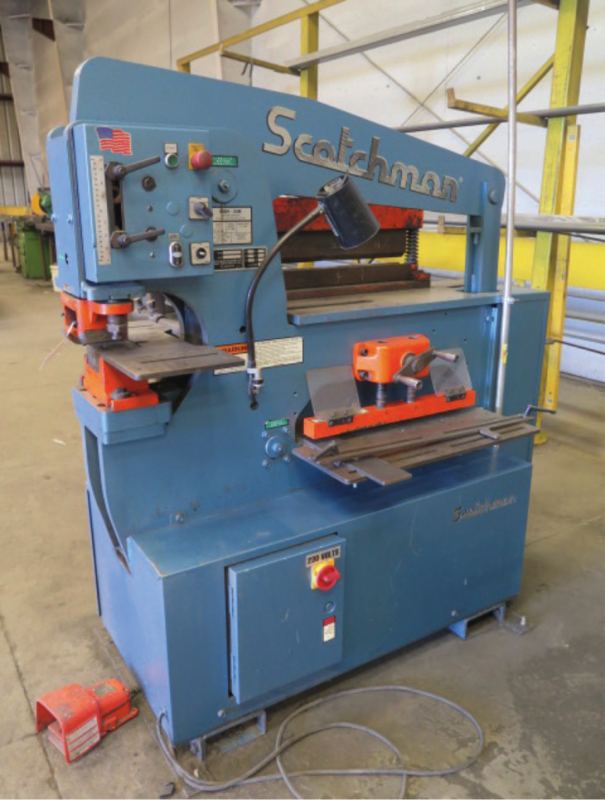 6509-24M 65 Ton Ironworker s/n 8149FF1112 w/ 65 Ton Punch 1 1/16” Thru ¾”, 9”Throat, Flat Shear 1” x 6”, ¼” x 24”, Angle Shear 6” x 6” x 3/8”, Press Brake Accessory. 1998 Ercolina “Super-Bender” Hydraulic Tube Bender s/n 4980187 w/ Bending Dies. 2007 KMT Kalamazoo mdl. H310M 10” Horizontal Miter Band Saw s/n 070606001 w/ GH Autocut Controls, Manual Clamping, Conveyors, Coolant. Doringer mdl. D350 15” Miter Cold Saw s/n 25160 w/ 2-Speeds, Speed Clamping, Work Stop, Conveyors, coolant. Nitto Kokki C-Frame Hydraulic Beam Punch w/ 4 ½” Throat, Hydraulic Power Unit, Boom Lift. 4” Coping Sander w/ Roll Assortment. Hopper &amp; Sons Pipe Bender. Delta and Power Pedestal Drill Presses. Ingersoll Rand 7.5Hp Horizontal Air Compressor w/ 2-Stage Pump, 80 Gallon Tank. Miller Big Blue 402P Diesel Powered CC/CV-DC Welding Generator w/ Diesel Engine, 4kVA, 4kW,120/240 V Output, 7485 Metered Hours. Miller Trailblazer 302 Professional Series Gas Powered CC/CV-AC/DC 11,000 Watt Welding Generator s/n LH480295Q w/ Kohler Gas Engine, 120/240 V Output. Lincoln DC-400 DC Arc Welding Power Source. (3) Miller CP-302 CV-DC Arc Welding Power Sources w/ Miller 60 Series Wire Feeder. Lincoln Idealarc SP-255 CV-DC Arc Welding Power Source and Wire Feeder. Lincoln PowerMIG 255 Arc Welding Power Source and Wire Feeder. Miller Millermatic 252 Arc Welding Power Source and Wire Feeder. Lincoln AC-225- S Variable Voltage AC Arc Welder. (2) Miller Millermatic 211 Auto-Set with MVP 120/240 Volt Wire Welders. Hypertherm Powermax 600 Plasma Cutting System s/n PMX600-057197. Proweld ARC1800 1800 Amp Stud Welder w/ Gun. Victor mmdl. VCM-200 Track Burner w/ Track. Bug-O Systems Track Burner w/ Magnetic Base Track. Lincoln LN-25 Portable Wire Feeder. (3) Lincoln LN-7 Wire Feeders. Phoenix Dry Rod Electrode Stabilization Oven. Heavy Duty Welding Tables 4’ x 26’, 4’ x 25’, 4’ x 11’, 4’ x 8’. Promotech mdl. BM-20 Portable Beveling Machine. Hilti DD200 Vacuum Base Core Drill. Hilti DD150-U Core Drill Head. Hougen Magnetic Base Core Drill. Hilti DS-HS80- 14 Gas Powered Concrete Saw. Hilti and DeWalt Electric Impacts. Hilti and Milwaukee Electric Drills. 5.5Hp Gas Powered Portable Air Compressor. DeWalt 14” Abrasive Cutoff Saws. Enerpac Hydraulic Rams and Power Pack. (2) Berger Level and Transit Levels. David White AL8-22 Automatic Level. Hewlett Packard Designjet T520 24” Color Plotter. Kyocera FS6525MFP Office Copy/Print/Scan/FAX Machine.